Math Update - Geoboard beauty! While learning about the properties of triangles and quadrilaterals, we had some fun exploring geoboards. The images the students made were stunning! How many squares can you find in each image below? How many triangles? Challenge a partner and see who can find the most! The 4/5 class is growing! We are growing in more ways than one! Today we welcomed a new student and we worked with Jen Schroth to start seedlings in the greenhouse. We'll be watering and monitoring the seedlings in the classroom until they are ready to be moved back to the greenhouse or to the big garden later this spring. Hopefully we'll have greens that we can eat at school before summer! Over the summer, the Brooklin Youth Corps will maintain the school garden and sell flowers and vegetables at the Brooklin Farmers Market. In the fall, the plants that are still producing will be harvested so that school-grown vegetables can be used in our lunches. Fourth and Fifth graders have been studying the etymology of their spelling words to help them understand their origins and why they are spelled the way they are. They have also been practicing for the school Spelling Bee, which was held yesterday. Congratulations to Phoebe for taking first place! 8th graders Adam and Davey came in second and third, and Wyatt took fourth place. Phoebe's winning word was "preen." Have you ever thought about how difficult it is to make a flat map to represent a round Earth? The 4th and 5th graders discovered it is even harder than you might think today. They turned oranges into globes and then tried to make a map out of the flattened peel. Last week, all of Mrs. Bebell's students participated in Slime Week, where each class makes a new slime each time they meet for science class! All of our slimes have explored different aspects of the states of matter. Unfortunately, with a snowstorm in the middle of the week, 4/5 missed some slime time, but they will extend their Slime Week into next week. A video on their final slime will be posted here once it is ready. The 4/5 class stared off their Slime Week with Oobleck, everyone's favorite non-newtonian fluid. We made kinetic sand using leftover Oobleck. We'll make our only edible slime of the week--Jello! Practicing math skills can be so much fun with games! One game we've played only involves a deck of cards. We call it "Product War" and it is pretty simple. Use the basic concept of war, but instead of putting down one card at a time, put down two. Say the multiplication fact aloud, and whoever has the higher product wins that hand. Another game students love is an app called Slice It! Students may not realize that they are learning geometry, fractions, and percentages, all at once. We also continue to connect Art and Math in SMArt time. We began making 3D diamonds, and identified all of the 2D shapes that were involved. February break is an excellent opportunity for us teachers to catch up on understanding the assessment data we have collected in our classes. Last week, I used part of my vacation week to dig into the NWEA scores from the fall and winter and look for growth trends to help inform my instruction. Overall, 4th and 5th graders made gains in math and reading, which tells me and Mrs. Tapley that the work that we are doing with our classes is on the right track. But on average, the students’ progress on the language NWEA test has stalled. This tells me that I need to put more effort into helping students to increase their time and focus on writing, spelling, and vocabulary. Spending more instructional time on writing conventions and and giving students time for focused practice while working on writing pieces and on iXL. Specifically, I plan on setting aside at least 10 minutes each day to practice targeted skills and then helping students apply those skills in their other assignments. Meeting weekly to collaborate with Mrs. Tapley and Ms. Nawrot. We will pull our individual strengths as language arts teachers together so that we may best meet the needs of all writers in grades 4-8. Increasing expectations on students’ individual progress in the vocabulary program by setting goals for students to meet each vocabulary week (they alternate with spelling weeks) and sharing progress with parents. Continuing to individualize spelling practice to meet the needs of each student. Currently, almost every student in the class is studying spelling words that are at least one year above grade level. Giving students more time to write a variety of writing pieces, including narrative writing, opinion and persuasive pieces, and informational writing. As always, please contact me if you have any questions about my classes or your children’s progress. I am generally available to talk before or after school or between 11-12:00. The 4th and 5th graders will be starting their chemistry unit this week. To begin, they will learn about the states of matter and physical and chemical properties. Help your child look for examples of solids, liquids, and gases around the house. After many weather disruptions, we finally have a date set for Poetry Night. Please join the 4th and 5th graders on Wednesday, March 1 at 6:00 for their event. There will be snacks and hot beverages to enjoy during the performance. Once we wrap up our poetry studies, we will begin reading a new novel as a class. 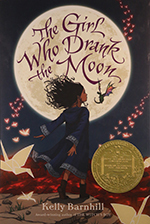 The Girl Who Drank the Moon by Kelly Barnhill is this year's Newbery medal winner. We'll also be starting some new writing projects in the coming weeks, so be sure to ask your child what they have been writing about in class.